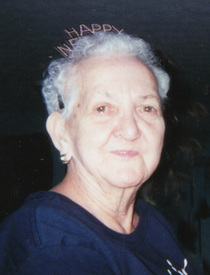 Ila I. Sims of Woodsfield, Ohio passed away Tuesday, June 17, 2014 at Barnesville Hospital. She was born in Woodsfield, Ohio September 29, 1926 to the late George and Trella Scott Mahoney. Ila enjoyed socializing, playing bingo, and working her word search puzzle books. Preceded in death by two sons Ricky and Steven Marshall, brothers Joe Mahoney, Clarence (Pete) Mahoney, Chuck Mahoney, Harold Ricer, and sisters Maxine Sims, Maude Scott, Lenore Bonadio, and Hazel Ault. She is survived by one son, Roger Marshall of Akron, Ohio; two daughters and sons-in-law, Judy and Ralph Morton of Woodsfield; Laurie and Gregory Polovick of Akron; three step-children, Ozella, James, and Charles, and several grandchildren including, Sheri Morton, who was considered to be her “anchor”. Friends received from 2 – 4 p.m. and 6 - 8 p.m. Thursday, June 19, 2014 at Bauer-Turner Funeral Home 100 S. Paul St. Woodsfield, Ohio where Funeral Services will be held at 12:00 noon Friday, June 20, 2014. Burial will follow at the Oaklawn Cemetery in Woodsfield, Ohio.